This is a tutorial on linking Mimir Classroom with your course on Desire2Learn. First, log into an instructor account on Desire2Learn and your instructor account on Mimir Classroom. Using Desire2Learn, your students will never have to go through the registration process; they can simply click a button on your classes Desire2Learn page, and they will automatically login through a linked account. You should only have to perform these steps once for each course. 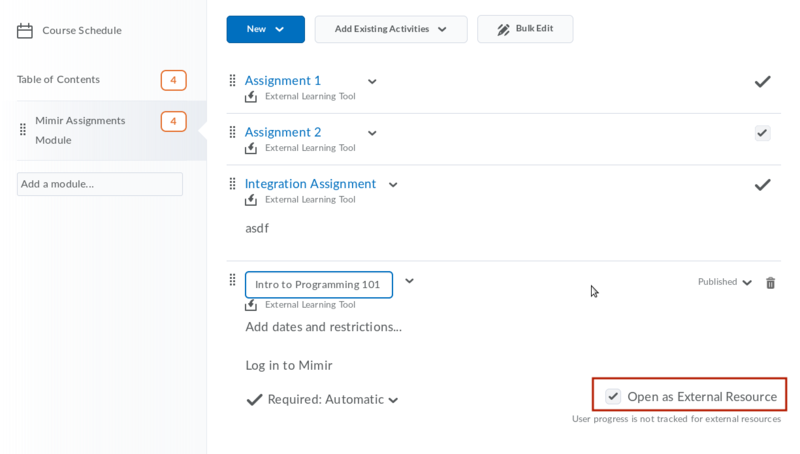 To link your Desire2Learn course with Mimir Classroom all you need to do is create the custom tool link that your students can click to log in at any time. First, navigate to your course homepage on D2L. Then click on the “Edit Course” button. If you do not see “Edit Course”, look for “Admin Tools.” Click on the “External Learning Tools” section. Now click the “New Link” button. In the Title field, enter something like “CS101 on the Mimir Platform”, to indicate to the students where this link will take them. In the URL field paste the following without quotes: “https://class.mimir.io/users/lti_login”. In the Description field, you can write a short description of this link, perhaps letting your students know this is where their programming assignments will be graded. Select Allow users to view this link, so that your students will be able to click and log into Mimir Classroom. 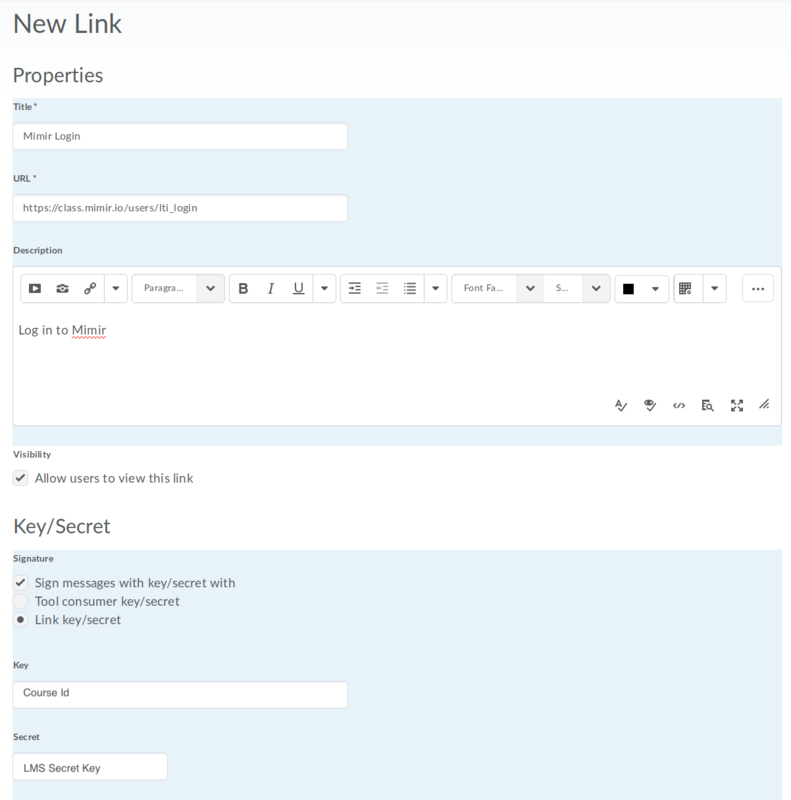 You should at this point have an option between “Tool consumer key/secret” and “Link key/secret”, select Link key/secret. This will reveal two more fields, Key, and Secret. To fill in these fields, we’re going to switch over to Mimir Classroom. 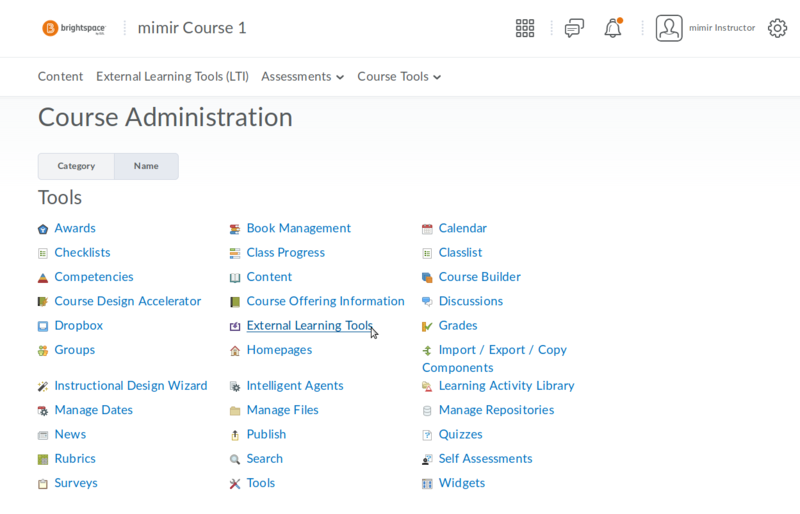 Head over to your course’s page on Mimir Classroom and select the corresponding course. You should see a “Course Details” under the course settings button. Here you will find the two fields that you need to fill out the form and set up the Mimir Login app. Copy the “Course ID” into the Key field and the “LMS Secret Key” into the Secret field. Depending on your version of Desire2Learn, you may see a “Security Settings” section like this one. If you do, make sure to check all the fields marked “Required” above. The “Recommended” fields can be left unchecked, but checking them will make the signup process for students much faster (as they won’t have to input their name and email). Our platform does not require any custom parameters, so you can move ahead to Security Settings. We recommend you select all options here, if some options are not enabled your students will have to fill out some fields on their initial sign on to the platform, but after that they will be able to login in one click every time. Now click save. You should be able to test the new link yourself, clicking on it should log you into your account on the platform instantly. And after all that, you’re done! Your course will now have one-click login from your Desire2Learn page.